L’shanah tovah to the tribe! May 5777 bring you health, happiness, and peace! In the spirit of peace, I bring you one of my favorite cookies of all time. Behold the black and white! We won’t be calling them anything else – none of this half-moon nonsense – they are black and white and beautiful!!! If you can believe it, I found the recipe I followed from The Pioneer Woman (yes, not a New Yorker, but the recipe was LEGIT) was simple and easy. The photographs in their blog post, however, were very different than what I experienced in my kitchen. My kitchen is messy, my cookies sometimes not perfectly circular, and sometimes my frosting isn’t perfectly aligned like with a ruler. 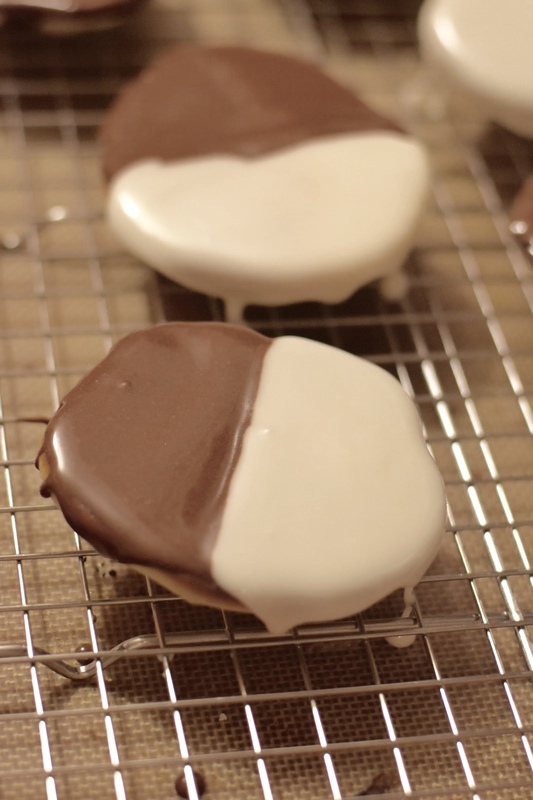 But I have to tell you, if you give these cookies a day (or overnight) to fully set up, they taste exactly like classic New York black and white cookies. The ingredient list has vanilla AND lemon extract. If you don’t have lemon extract, it’s not the end of the world. Just add a little more vanilla. But if you DO have lemon extract, it’ll impart a beautiful lemon fragrance to the cookie which will really bring you back. Oh – and the recipe only makes 8 cookies, so you’ll definitely want to double or triple the recipe. You’ve been warned! 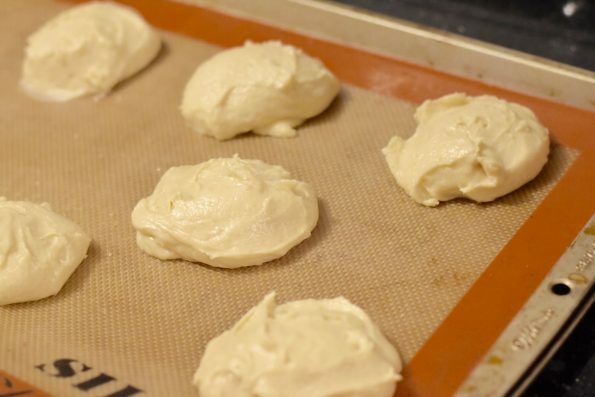 You will want to use either parchment paper or a Silpat (a silicone mat) on your sheet pan or cookie sheet. The cookie, which is really a soft cake, should be babied while warm, and parchment or a silpat will do that. You don’t really want much color on these cookies, and not having contact with the metal sheet will accomplish that. A large-ish scoop (3″ ice cream scoop suggested/used) but you can experiment with other scoops that will leave a circular cookie. A cooling rack. While you can get away without it, you will want the cookies to cool as quickly as possible. You really do want them to dry out a little bit too. The cooling rack will help on both counts. In one bowl, add the flour, the baking powder, and the salt together. In another bowl, add the milk, egg, and both extracts. 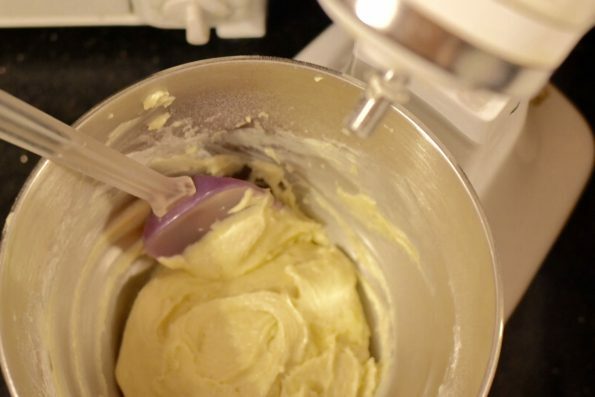 In the bowl of the mixer (or in the main bowl you’re using), cream together the sugar and the butter. Once creamed, add half of the dry mixture and half of the wet mixture together slowly, so that the mixture is fully incorporated. Scoop the cookies onto a prepared pan (I used a silpat but parchment paper will work too) and leave room for spreading. I’d say 2″ separation would be fine. These cookies will average about 3-4″ wide, not your usual 6″ or so from the deli. Bake for 15 minutes until a toothpick comes out dry. When the cookies are ready, remove them to a cooling rack, and let cool completely. Are they perfect circles? No. Do you need them to be? No. They will be DELICIOUS no matter what they look like. While the cookies are cooling, make the glaze. In a bowl, add confectioner’s sugar, 3T milk, and vanilla, and whisk to make the white glaze. Is there a lot of sugar? Yes. It will all combine. DO NOT use any other kind of sugar for this. Promise me you’ll use good old fashioned confectioner’s sugar. OK? Let’s move on. Take half of the white glaze and put it in another bowl, and whisk in the additional tablespoon of milk and the cocoa powder. Whisk until completely combined. Once the cookies are cooled, FLIP THEM OVER. You will be glazing the FLAT side of the cookie. 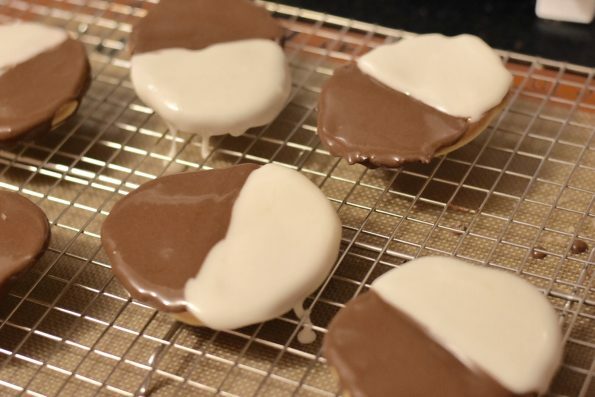 If you skip this step, the glaze will run off the cookie and you’ll have a bald black and white cookie. That’s just weird. 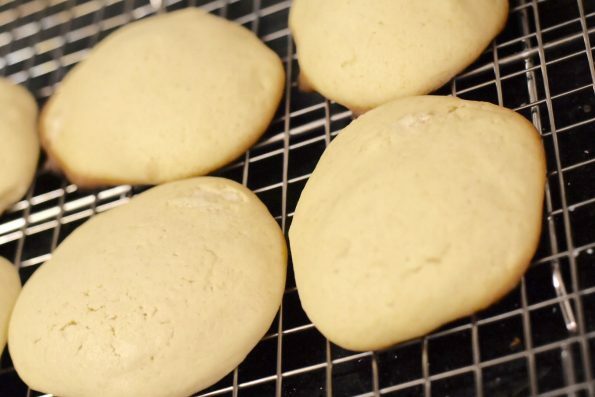 You could use parchment paper, or a ruler, or the edge of an envelope to make perfectly equal, perfectly glazed cookies. Or, you could be like me, and can’t wait to sink your teeth into the wonderful glaze that got all over your fingers while carefully glazing, so much so that you didn’t pick up your camera to photograph the process. Whoops. Anyway, do these cookies look any less appetizing? I didn’t think so. You could eat them right after glazing, but I am telling you, these cookies actually will benefit from a few hours’ setting up. The glaze will have a bite, the cookies will be firm and fragrant, and it will bring you back. So do yourself a favor and wait. Your patience will most definitely be rewarded. So definitely look to the cookie, and have a sweet new year!